Yay! Finally the blog giveaway I promised! Yes, It's definitely Christmas because Firmoo is giving away $20 vouchers to 20 of my lovely lovely followers! YAYYY! What is Firmoo? It is a popular online eyeglasses store that provides a good variety of very nice styles to choose from. They also give their new customers free glasses with only the shipping to pay for! How awesome is that!? Watch the video to see how! Here are my top picks for under $20! The first one, is the typical rectangular black frames...which is nice because of the thickness & for added seriousness to your look. The next two, I love for their size! The 4th one, is like my wayfarer glasses but it has more the cat-eye look? HAHA. Lastly, it almost reminds me of my first pair of glasses which I mentioned in my last post only difference is that it's clear instead of white. It also reminds me that I should have just gone with the clear wayfarers than the black one when I got my second pair of glasses. For under $20, they don't look bad at all! All looks so promising...makes me want to have it all! Teehee. Here's the deal! I'm giving away 10 vouchers here on my blog & 10 on my Facebook page for my Facebook likers! You can do both for a better chance to win a voucher or another one for your friend or family! The vouchers apply to any order except on Designer glasses and valid only until December 25th! The giveaway is international and ends on December 19th! 6. Tweet about this giveaway. (Tweet everyday for a point!) 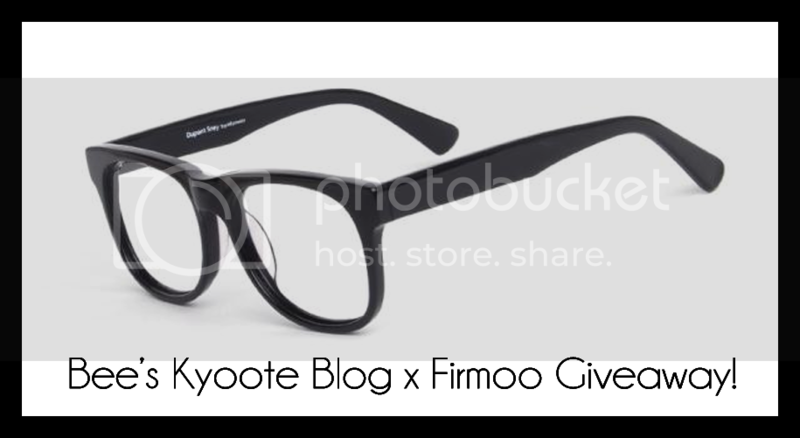 "Win a $20 Voucher from @beekyoote & @Firmoo Online Optical Store! http://fb.me/1YkjpKn7C #beekyootefirmoogiveaway"
7. Like my Facebook page. 8. Follow me on Networkedblogs, Bloglovin', & Google Plus (a point each). 9. Go to my Eyeglasses History post & answer the two questions given (additional 2 points!). *** winners will be announced here. 1. Like my Facebook Page. 2. Like my shared post on this giveaway. 3. Like the picture of this giveaway. 4. Comment on the picture "what time of eyeglasses do you find appealing and why?" 5. Like Firmoo's Facebook Page. **winners will be selected randomly. ***winners will be announced on my facebook page. They haven't actually sent me anything yet... they should be send the voucher codes to me though. I just received their email! But do you mean the voucher or eye glasses? You didn't get anything yet? Boo, hopefully you get yours soon!